Be sure you've checked our Quick Find Page to insure your device isn't already on our website. Screen protectors between 2” and 3.99” will come in a 2 pack. A kiss cut sheet of screen protectors is similar to a sheet of stickers: There is no top liner on this cost-effective production method. *Our Screen protectors work on 98% of touchscreens, if an ELO or a device with Infrared, IntelliTouch or Surface Acoustic Wave technology, touch function may not work. We recommend a sample to test the touch function. MXT: Anti-Glare 50% (matte finish with low surface reflection.) Recommended for TVs, digital displays and corporate use on monitors and industrial equipment. MXG: Anti-Glare 85% (Maximum anti-glare, matte finish.) Much improved anti-pixelation. Recommended for large displays such as TVs and panels, but suitable for small devices such as phones. MXH: Anti-Glare 25% (light matte finish.) Recommended for all monitors, cell phones, tablets and other mobile or stylus devices. 5HS: Shock-Absorbing Anti-Glare. Maximum blunt-force and anti-glare protection. Recommended for all devices – especially industrial, with 85% anti-glare surface. MXO: Clear. Excellent image quality. Oleophobic ease of cleaning coating. Recommended for use on all devices. MXB: Blue Light Cut. Good image quality. Cuts excess blue light emitted from displays.Recommended for children, and persons who spend a lot of time looking at screens. Very slight blue tint when applied. 9HO: Clear Glass-Like Hardness. Recommended for use on all devices especially drawing tablets, mobile & POS devices, and industrial equipment. Excellent image quality. 9H surface hardness provides extreme abrasion resistance with smooth-touch and oleophobic ease of cleaning coating. 6HS: Anti-Scratch and Anti-Shock Film. Excellent image quality. 6H surface hardness provides good scratch resistance. Provides impact protection. Shatter-proof, unlike tempered glass. Use on all devices. P2L: 2-Way Privacy Filter. Adhered with the help of clear double-sided tapes and or tabs that attach to your monitor's frame. Mini-louvers embedded in film reduce screen viewing at 30°, nearly black at 45°. P2S: 2-Way Privacy Filter Silicone. Adheres directly to the monitor with full silicone adhesive backing. Mini-louvers embedded in film reduce screen viewing at 30°, nearly black at 45°. P4S: 4-Way Privacy Filter Silicone. Provides privacy from 4 directions. Adheres directly to the monitor with full silicone adhesive backing. Mini-louvers embedded in film reduce screen viewing at 30°, nearly black at 45°. Devices 16.9” or less will get 2mm corners, Devices 17”+ will get 3mm corners. For non-standard corners, cutouts for cameras, buttons, sensors etc, please fill out the Screen Information Sheet. Will you need a complete install kit for each film? Is this for a vehicle's in-dash screen? Would you like your purchase to be bulk packaged? Please ensure the dimensions you entered are accurate. Refer to our return policy regarding custom cuts. Enter width & height dimensions in millimeters into the corresponding fields. (A conversion calculator is provided if you only have inches). Do you want the protector cut EXACTLY to the measurements you provided? If so, click the EXACT button, otherwise we will subtract .5 -1mm from each dimension for ease of installation. Click corner type box that correlates with your devices corners. For corners that are not square or 2-3mm please enter your corner radius in the “Enter Radius” box. Use our corner radii checker pdf for reference. 8pt (2mm) or 12pt (3mm) sizes are available. Placement options are bottom left, right or middle. 1) Filling out our Custom Cut Screen Information Sheet (CCSIS) to help communicate cutouts, corner radius and shapes. 2) Provide us with your own drawing in .pdf .dwg or .crd format. If unsure about the measurement process, watch our short video on how to measure. Having the correct dimensions is very important when ordering a custom screen protector. We do not use the diagonal dimension to make a custom cut screen protector, but it is helpful in identifying the device. Review the images below to determine the area to measure depending on if the device is framed or frameless. If unsure of which film type to choose, we recommend that you order a Sample Pack. This is an inexpensive way to ensure you choose the film that works for you. There are 3 sizes, 2x3”, 3x5” & 8x10”. We offer free shipping within the USA and charge $2.50 to ship them international. We include a $5 coupon towards your purchase with any purchased sample pack. Click corner type box that correlates with your devices corners. For corners that are not square or 2-3mm please enter your corner radius in the “Enter Radius” box. Use our corner radii checker pdf for reference. The custom cut screen information sheet (CCSIS) or your own drawing is helpful to insure you recieve the proper corner types. Page 1 of the (CCSIS) has the radius of some common home and office items. Page 3 has a printable corner radius checker from 1 to 40mm. Providing this information helps us identify your device to see if more information is needed. By confirming your custom-cut screen protector or privacy filter, it allows us to put it onto our website as a new standard product so other customers can then order it. Be the first person to confirm a good fit of the screen protector by providing a picture of your device with it installed and you will receive a $10 coupon (transferable) towards your next purchase. A complete model number and picture is required to qualify for this offer. Screen protector confirmation must be received within 60 days of purchase to qualify. We can etch your name, company name, a logo or anything you desire into the surface of the film (up to 30 characters at 8pt up to 12pt) and you can choose the location. Please note, for smaller devices, the larger font may not be available. Custom cutting is our specialty. With our top-of-the-line technology, we can cut any shape or size to meet your needs (up to 100” diameter for many film types). Camera holes, notches or different corners are no problem for our specialized tech team. Installation supplies are included with each order. 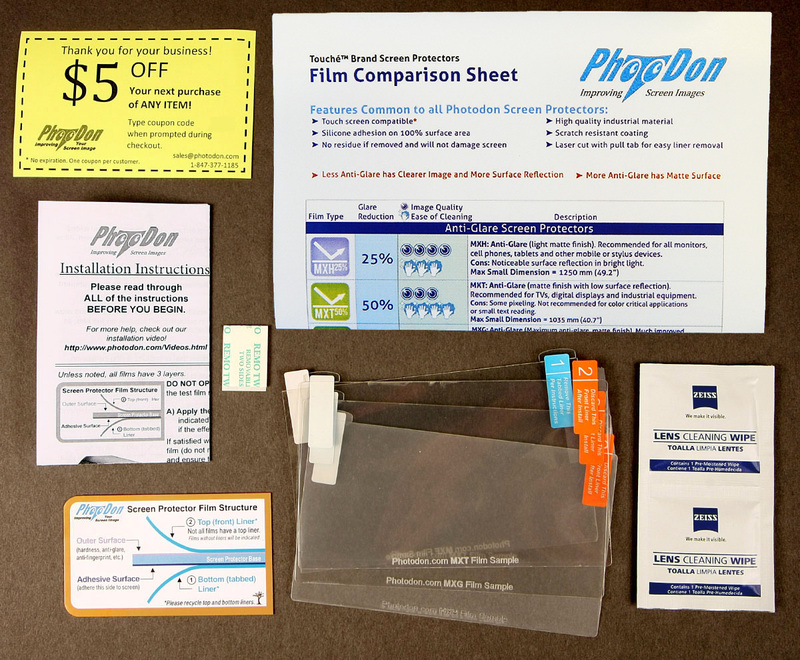 Kits will vary depending on film type, size, and packaging options. Look for the "What's in the box?" section (left of the measurement input field) to see your kit supplies before adding to your cart. A Special Offer: Be the first person to confirm a good fit of the screen protector by providing a picture of your device with it installed and you will receive a $10 coupon (transferable) towards your next purchase. (A complete model number and picture is required to qualify for this offer). Screen protector confirmation must be received within 60 days of purchase to qualify. Photodon's special services include: custom cutting, film layering, film etching, custom kits and installation of our film on your device. Our screen protectors work on 99% of touchscreen devices however, monitors with IntelliTouch/surface acoustic wave technology DO NOT seem to work with silicone screen protectors. Please consider our Monitor Hoods for anti-glare solutions for these devices. Photodon has the best customer service. I have made couple of custom made screens already. The most impressive one was the compression of the anti-glare and anti-blue together into one for use with my laptop. I strongly recommend this website and I will use their service again for sure. We're glad we were able to help! Since I didn't know what type of screen protector I needed, I ordered the sample pack first. I wanted to put it on the touchscreen of my stove. The measurements came out perfectly and the corner radius sheet was easy to use. With my past experience with other companies, I was fully expecting having to modify the protector to fit. To my pleasant surprise, this was not the case. The fit was seamless and you cannot tell that there's a protector on. Installation was easy as well with the kit that they give you. Good job on measuring, Sharlene! Customers like you make our job easy. They were very kind and attentive through out conversation thru email and the product is awesome!! We're happy we were able to help you, Hlim! Couldn't find a screen protector for my pen display anywhere online, and was so happy when I found this site. The screen protector came exactly as specified and was an easy install. Will definitely be returning for more customs in the future. Thank you so much! We're happy to help, Ambriel. We appreciate you taking the time to give us feedback. Custom Screen Protector for InFocus 57"
Ordered this to reduce the amount of reflection from our monitor. Product came as advertised. Glare reduction is really good. It was easy to put on. The kit included everything need to apply the screen protector. I would recommend this product to anyone looking for a screen protector for their monitor. If they don't have a stock size to fit, they will make one at very reasonable rates! Pros: Quality product, custom sizes, ease of install Cons: Sharp, very precise edges (if that’s a bad thing). Great product and fits perfectly with my custom dimensions I provided. The website is easy to navigate and the instructions on how to order a custom size piece were spot on. Custom size was produced and shipped to me (express) very quickly. I will deffinately be trying out their other products. Pros: Went on fairly easy Cons: Still shows plenty of glare at certain angles. Hi, Charles - We would send you a replacement for a 50% discount. We also sell larger samples, so next time you're in the market, you might want to go that route. Thanks, Charles! Bought a custom cover for an aging drawing tablet that no longer has covers available for purchase. The cover was cut very accurately, and the extras for installation and cleaning are much appreciated. Great price too; I've bought some other third-party protectors for this tablet that worked alright, but the cost was higher with flimsier materials in comparison to the cover from Photodon. Thank you very much! This is my second purchase from PhotoDon and like the first the second was perfect. My Fuji X-T3 seems to be too new for the manufacturers of screen protectors and all three bought from the marketplace failed in fit. The one cut by PhotoDon was perfect, all four of them! The fact that for their incredible fees they sent a complete kit for assembly goes well beyond service and satisfaction. This is the spot for screen protectors, period! We so appreciate your support and loyalty! It it very satisfying to know that our efforts are noticed. Outstanding customer service. Ordered two custom screen protectors for two high end sewing/embroidery machines. Easy instructions (template was great) to measure for corner radius. Great quality, but more importantly, perfect fit. One of the films had some scratches on it. Contacted customer service. Drew was very helpful, instructed me to send in a picture. He actually had full knowledge of my custom order. I left for a short vacation on a Thursday, the replacement film was waiting for me on Monday upon my return. Imagine my surprise. I have ordered screen protectors from Photodon for a few years now, and have never been disappointed. Photodon has been my go-to site for all my screen protection needs. I will now pass the custom measurements and your website, (yes, I volunteered to be the test case), to my friends so they can order their films. Thanks Photodon! Thank you, Masey! We appreciate your support and your positive feedback. We're glad you had success, Kevin! Our shop has a Trumpf TruBend 3066 press brake and the factory screen protector was worn out. The Photodon replacement fit perfectly! Following the instructions that came with the film and the install kit, the film went on without issue, and without any air bubbles! The MXH should last you a good long time, Tony. We're glad your had a successful installation experience. Hi, Brittney - Sometimes if you've provided measurements that are too tight to the edge, bubbling will occur. Please contact us if you'd like a replacement film for 50% the cost. I wanted to protect my HP Spectre 15". Ordered the MXH and the installation was easy. Just do your research on Youtube to see how the MXH affects the color. Just install slowly and have some tape ready to get any dust that you see that is trapped during install. I requested custom holes and they are slightly off and didn't bother checking the measurements I placed vs what was given. I might order again to see if I can get better hole placement but the one I ordered covers the screen perfectly, so I am in no rush to do so. We do our best to provide this custom service and appreciate your attention to detail! I invested in a very expensive Automotive Diagnostic device for my new job. The device is the size of a large I-Pad with a heavy duty bumper protection device. The size is oddball. I measured as instructed on the website, used the conversion from inches to millimeters, and then subtracted 2mm from my final numbers just to be safe. I figured a little smaller would be better than too big. It fit PERFECT ! I am thrilled. I followed the directions exactly and was able to apply without issue. This is good news, Robin. we searched and searched high and low for a screen protector to fit our launch auto scanner. we came across photodon because they furnish ones for our autel scanner. ordered the custom fit one. was a little nervous on my measurements received it in and it fit perfectly. Thanks for the feedback, John! Let us know if you need another bag. Pros: it works, easy to put on, and arrived promptly Cons: none, I can think of. I ordered a custom cut screen protector for my microwave oven key pad that had light starches on it. Super easy install and you can remove it to make sure its perfect if you don't get it right the first time. My key pad looks amazing like brand new and perfect fit so you can not even tell its on there. Thank you!! So glad I purchased this. Amazing is good! We're super glad you're amazed! Pros: The MATTE FINISH is spectacular Cons: Not any. Just need to have proper dimensions. Ordered a Custom Cut for a glossy laptop screen. I wanted to lessen the glare of the screen and have a matte finish ultimately, since it is a preference. The product did not disappoint! After giving the Test Film a go, the actual film was not really hard to apply. Already had interesting comments/questions about having a matte screen when people know that this certain laptop is not a matte screen finish. Thanks Photodon! Thanks for the feedback! This review makes us proud! Quality and ordering process is 1st rate. This company is professional and cares about putting out the best product it can. Customer support is also top notch. We're glad you're happy with the MXA film and the custom cut service, Joseph! i bought a car stereo with a capacitive screen, in direct sunlight the screen was very reflective. after installing the anti glare screen protector most of the reflections are gone, a huge improvement! the protector was very easy to install, and the adhesive seems to be a good quality.product shipped fast. overall very happy with my purchase. only complaint is the texture is slightly rough, compared to glass (guessing this is a property of the anti glare to prevent reflection) not a big deal just not as smooth as a glass screen. Thanks, Steve! We're glad you're happy with the film! Pros: Easy install, perfect anti glare in direct sunlight, very clear Cons: non so far. I used a digital caliper to measure the 2 screens this camera has and the custom cuts were perfect. There were 6 included for the small top screen and 2 for the back main screen. Both worked perfectly in the first tries so 1 backup large and 5 backup small. Love the look of them and perfect amount of clarity and anti glare effect. We love getting feedback about how the anti-glare works in direct sunlight. Thanks, Daniel! I put exact measurements and they were spot on great product all and all. We hope you like the 6HS on the Hornet XPR300. Thanks for the feedback Wayne! This is such a nice review. THANK YOU! You must have measured well! Welcome to our team, Sharon! Great communication with CS/Techs. They helped me hone in one the proper product and once, chosen, went to work straight away. It looked like it took some underground CDC BIO-Level IV team to install this from their docs. Even though, through my own error, I was off by 3 degrees, it was still a bubbleless and completely successful install. The screen is 99.5% covered and works effortlessly in the sun and is 100% touch reactive. Given the high level of competency of this team and the product they stand behind, I will buy from them in the future if needed, and will surely refer them. Thanks, Ryan. We appreciate your feedback! Excellent fit, easy bubble free install - especially gizen size is large, and lightning quick installation. And of course, the touch screen alarm panel works as well with the protector on as it did without having one so there is no impact to function. Thanks for the feedback! We appreciate the fact that you read through our instructions and had a very good installation experience. The cut was great; however, when I used the lint free cloth it dropped white specs onto the screen that got caught in the protector. Very disappointed. MXT on large TV screens IS very effective. We appreciate you sharing your experience with others, Robert! Awesome product. Easy to install. Cuts out almost all my glare but but retains image quality. I can barely tell it's on. I'm using this on my 49 inch monitor for work. I was getting headaches from the glare, and this really helped. We're glad to hear that you like the 85% anti-glare screen protector on your 46.6" Acer! Thanks for the feedback, Dennis. Great product to protect a $6,000.00 HMI. We had to replace three of these in the last couple months. The one we have protected has been bumped but did not break. This is great news! We hope this protector saves you a lot of money! I ordered an MXO custom cut screen protector for my Dell Inspiron 13 7352 All-In-One, which has a touch screen. I recently replaced my device’s screen and left the protective film, so I had no problems installing the protector, although I had to be patient aligning the protector on the screen and removing most of the bubbles. The screen protector is great and it is easy to clean. The touchscreen function works as if there is no protector at all. HOWEVER, given that PhotoDon did not have a protector for my device, they had to rely on my measurements. I measured the screen in inches with an inch measuring tape with a not-so-precise 1/16” resolution, and then convert it to millimeters, which would have introduced an approximation error. As a result, the protector was about, say, half millimeter too wide, even as I did not check the “Exact” box, which means that 0.5-1mm is subtracted from each dimension. I also noticed that even though my device’s screen is 15 inches diagonally, the corners are more like 3mm instead of 2mm. Because of this, persistent bubbles appeared along the screen’s left border and corners, since the protector was touching the screen’s border. To solve this I used a very sharp X-Acto knife and CAREFULLY cut the protector’s border along the screen’s left border and corners. The top, bottom, and right screen’s borders and right corners did not have this issue. Unless you have a millimeter ruler and want to go exact, subtract 1mm from each side after converting inches to millimeters and do not check the “Exact” box so PhotoDon may reduce it a bit more. Then, you may install the protector with ease. Any screen does not really have to be exactly protected to the very edge. Friends from PhotoDom: I suggest that you update the measurements that I gave you and may have on record to 1mm less to 321.26mm wide and 203.79mm in case someone else orders the same protector. Also, you may use a 3mm corner instead of a 2mm one. Apologies for any inconvenience. As I mentioned at the beginning, the screen protector is great and I would recommend it to anyone. Thanks for the feedback! These tips are great for other customers, Jesus. We will replace films for a 50% discount if you need to get a second one. We appreciate your business. Thanks for the feedback on your purchase of MXT film. We appreciate your business. Ordered custom cut screen protector for 23" touchscreen All-in-one Computers on our production floor. Film fit perfectly. End user commented that they thought it came from the factory like that. Thanks again Photodon!! Thank you for providing us with accurate measurements, Don! Good quality film. MXH 25% is the best for my pen display. Thanks for the feedback, Nirut! We have clarified the etching feature on our website now, so thank you for your patience! Pros: Nice fit, easy to order, quick turn around. Cons: A bit pricey but you get what you pay for. This was a good value for what I received. Inmarsat Isatphone 2 Satellite Phone. Since no information was available on this model I had to measure the screen size. I did the exact measurement and let them slightly reduce the size to make installation easier. I still had the factory protective film on the screen so cleaning was easy and there was no dirt or dust and bubbles were easily removed. Instructions were very good and the kit included everything I needed to complete the installation. Thank you, Jeff! With small screen sizes, you can request a 2 pack so that you get better pricing. I measured my screen the best I could and had it custom cut with standard corners and it couldn’t fit any better! I love it. It is pretty hard to get the screen protector exactly centered and with me being a perfectionist when it comes to screen protectors it was pretty hard but ended up turning out very good! It’s clear and makes my screen have that nice glass texture to it that it didn’t have before. I love it! Photodon is cheap on their pricing and don’t charge for custom cuts! Literally can’t get better than this company! Only thing I didn’t like 100% and it’s not even enough to take a star away, is I was looking for a glass screen peotector like the tempered glass ones they make for iPhones. This is similar but not quite exactly the same. Still looks and works perfectly though! Thanks for the review, Ryan! Good job on the measuring and installation. We appreciate it. The item was exactly as described, installed perfectly and works great. Thanks for the good work! We're glad you liked the 9HO on for Autel - MP808TS - 7" screen protector, Jason! Thanks for the positive feedback. MXC is a nice film, Jeff. We're glad we could save you so much money! Pros: Top notch quality film screens for ANY size screen Cons: ZERO! Awesome products, make sure to read the directions before applying and you won't have any problems! I searched far and wide for anti glare protective films for several laptops that have unusual screen dimensions and Photodon is the ONLY company to meet my requirements. I was ripped off several times on Ebay with screens that claimed to be anti-glare and matte and in fact were the opposite. I was on the verge of giving up before coming across this great company and their products! All other anti-glare films (from Amazon) these days are in the 16:10 ratios and good luck finding one in 16:9 or for screens larger than 20" diagonal. Also the prices you pay for these films are approx. 30-60% more than what Photodon charges in my experience and likely won't fit your screen dimensions exactly. Fortunately Photodon offers a unique custom cut option so you will always get that perfect fit for your specific needs. The shipping is ultra fast and the screens come with a kit that helps with the application. My personal advice is to clean your screen thoroughly with the supplied micro fiber cloth and cleansing spray, then put a tiny amount of spray on the screen just before applying the film. This added moisture makes getting bubbles out MUCH easier. Make sure to peel away away the 1st layer of the film as you are applying it to your screen to eliminate the chance of any dust getting trapped under the film. I have applied six of their films using this method to both 17.1" and 20.5" screens with perfect to near perfect results. I cannot recommend this company highly enough for those looking to reduce glare on their digital devices/television screens. Thanks for the very thorough and thoughtful feedback, Stefan. We will pass some of these tips along to others. We appreciate your business. Saved me from buying a new laptop! Pros: Does what it says it does without reducing the fidelity or clarity of whatever you are working on. Cons: A little nerve-wracking to apply but definitely doable if you take your time. I bought the MXG screen for my laptop and am now able to work on it in any lighting conditions even to edit images in Photoshop. Before the screen, the reflection and glare were bad enough that I had quit using the laptop and was considering buying a new one. My $30 investment saved me $7-800. Yay!! Happy, happy, joy, joy! We love saving our customers money. Thanks for the positive review, Kris! We'll spread the news! I had you cut a custom screen protector for a dive computer screen. I ordered 3 and received 2 extra. Far exceeded my expectations. Let us know how this work for you! Thanks for the positive review, John! I decided to try out a screen protector geared towards image quality rather than pen feel on my Galaxy Note 4. Got it custom cut, and it turns out that I failed to account for some slight curving at the edges and overestimated the radius of the corners, so it's not a perfect fit. It works fine though, the edges aren't lifting even if they're not perfectly attached to the screen. The image quality is excellent. The tactile feel was originally a bit too tacky, I think is the word. It seems to have smoothed out to acceptably smooth. It doesn't feel as good as their matte screen protectors, and pen feel is smoother than I prefer (I like enough drag to simulate a pencil). If I liked the plastic nib on glass feel, I'd probably stay with MXO, as it does a much better job than the MXH, my favorite Photodon screen protector, at resisting fingerprint oils. I had hoped the MXO would eliminate the need to clean off fingerprints, but I guess I just have oily fingers, because I still need to wipe down the screen every so often. This was an interesting experiment. I don't regret getting the MXO, but I will probably stay with the MXH in the future. We appreciate your taking the time to share your experience with our other customers, Teresa. We do have a policy of replacing your screen protector at a 50% discount is you should choose to have us replace the one you purchased. Ordered a screen protector for the Acoustic Research AR-M2 Hi-Res Music Player custom cut by photodon. Has a 1 mm clearance around the edges to allow removal if ever needed. The players screen is very reflective and a fingerprint magnet, this screen protector protects my screen from scratches, reduces glare and fingerprint mess using the MXH type. I found the instructions very clear and the supplied accessories were a perfect addition. The screen protector was precise in its dimensions. cant fault the product really, especially as they send you a spare, just awesome. This is my second order within as many weeks, would not hesitate to buy from them again. Thanks for the fantastic feedback, Thomas! We're glad we were able to help! Pros: Excellent service and product. Extremely precise custom cut protectors. Cons: Slight haze under direct light and not as anti-finger print as other protectors I use. I have never used any of Photodon's products until now so I took a chance when I ordered a few custom cut 6HS screen protector for my brand new SmallHD 703U 7" Monitor. The shipping was fast, the form to submit the custom cut requirements was straight forward and easy, and there was very clear communication throughout the buying process. The screen protectors arrived well packaged with everything needed for installation. Installation was quick and easy. My few minor criticisms include: the screen protector wasn't as anti-fingerprint as I hoped (minor issue), I did end up with a tiny bubble in the lower edge-corner that I can't seem to get rid of (it's the same corner where the tab for the adhesive layer was to be peeled off), and under specific angles under direct sunlight, there is a slight haze to the protector. But otherwise, it is a great product and I am happy with the results so far. Time will tell how scratch and impact resistant it is. Thanks for the thorough review, Alex. MXO has more anti-fingerprint properties. Please contact us if you are not completely satisfied with your screen protector. Pros: Packaging, instructions, quality Cons: I always manage to get 1 piece of dust caught under. I am very satisfied with this screen protector. I got it for my Lexus in-dash screen since the anti-reflective coating was coming off. The screen protect was cut exactly as intended and was package well. The instructions for installation were very clear and includes everything you need. The film itself was exactly what I expected. Nicely tinted. MXH is a great film for in-dash displays. And yeah, that dust thing is a bummer for many. Thanks for the feedback, Anthony! Thank you for the great feedback Josh! We're glad it was a good fit! Pros: Sized exactly as ordered, fantastic quality protector. Cons: Exact sizing means you have to be more careful getting it straight. Worth it for results! Having tried two screen protectors for the Kobo Aura One to disappointing results, I tried having one custom made by Photodon. I couldn't be happier. Sizing was exactly as ordered, cover quality was great, and the application kit and shipping were perfect. Excellent work! Thank you, Daniel. It's nice to get this kind of feedback. Our goal is to be the best in the business. If you're looking for a screen protector for the new kobo aura one, the custom cut photodon.com does for it is perfect. Unlike the other screen protectors currently for this eReader that only cover the reading area, this custom cut does what other current screen protectors fail to do...cover the whole screen. I highly recommend buying their custom made one as it's exactly what you'll need for your new Kobo Aura One. Thanks for the feedback! It's nice to know that we offer a unique product that will help our customers. From my friend who I gave this to as a gift: It's packaged well. In the sense it has nice labelled tabs and clear instructions. Minimum distortion from the matter effect, and adds a good amount of tooth for tablet pens. We're glad you like the MXH film. Thanks for the positive review! Our brand new Makino WEDM machine has a touch surface interface, with an odd size. Since this is a $200K machine that cuts tool steel, we needed a screen protector to help mitigate the eventual meeting of steel and screen. After half a day of searching, I found Photodon, who I think is the only custom screen protector company who has an internet presence. Thank you so much for the great review, Scott! contacted me directly about my order and what the right product was. Very helpful. We do our best, Zachary! Thanks for the kudos! Pros: Quick, easy installation and looks great. Cons: Chance that it will delaminate. I too ordered a 9X5 MXO film for my Honda Pilot display. I had read about your products in the Piloteers.org forum and noted the issues that people were having with delamination of the MXO product in colder temperatures. I also read that most people didn't like the loss of clarity that resulted from using the MXH film. Since the Pilot display is severely fingerprint prone (putting it mildly) and I did not want to sacrifice clarity, I decided to take a chance on a custom-cut MXO film. I installed the film in temperatures above 50 degrees F and I too am hoping that because I avoided installing the film over the curved edges of the display that it will be less likely to delaminate. Others have had success doing it that way, I hope that I will too. Having said all that, the product was extremely easy to install and does an excellent job of keeping the display fingerprint free. So far, I'm a happy camper! Let's keep our fingers crossed, Peter! I had this custom cut to fit my 2016 F150 touch-screen. It fits perfectly and was very easy to install; no bubbles, no dust. I live in Alaska and often see temperatures below zero (-58 is the lowest I've seen). The screen protector holds up well even in this extreme cold. When the temperature does drop well below zero, the protector will develop a lot of small bubbles underneath, but as soon as the inside warms up, all bubbles go away, and I do mean they all go away. I can't find even one tiny bubble. I am very impressed with this product and the cost is very, very reasonable. A very small investment to protect an expensive part of my truck and keep it looking good for a long time. Thank you and keep up the good work. This is wonderful feedback for other customers, Steven. Thank you for taking the time to provide it. Stay warm up there in Alaska! We here in Northern Michigan have cold winters, but you've got us beat! Be well. So far so good! Installation was super easy and the look of it is great. It is a little hard to see sometimes with the matte finish of the product, but overall great product. Good to know, Anna. Thanks for the feedback! Was cut to work specifications, but luckily I had a razor. On the plus side, there was an entire kit included. An anti static spray, a monitor cleaneing spray, a silk cloth, microfiber cloth, a suede cloth, and a sample of the protector to try before applying. Was very pleased to find all of those extras, although next time I think I'll use the pre-cut sizes. Would definitely order from them again overall I was very happy with the purchase, aside from the wrong sized protector. Custom cutting can be tricky -- we will cut to whatever dimensions you provide us. We're glad you were able to reach a solution, Pete. Pros: Image quality is not compromised. Cons: Some glare. Very happy with my purchase. The quality of my image is very important, so I didn't want a cheap screen protector that would impede that quality. The one I bought from PhotoDon has so far been very satisfactory. I got the 25% anti glare, and have found it to be very good in most situations. When you're happy, we're happy, Aaron! Custom Cut for Dell XPS 13"
Fit much better than expected. Excellent improvement to the screen! This is great news, Nathan! I usually use MXG for pen displays, as it has a great Cintiq-like tooth for drawing. On this large pen display, however, the gap between the glass and LCD was large enough for MXG to blur the screen well-beyond the speckle effect. Photodon worked with me on finding the right product, and we found that MXH was the best one for the job. Still has some tooth without the blur. Good to know, Eric. Thanks for your kind words! I bought this screen protector with the MXC-Perfect Clear finish and am for the most part pleased with the product. I applied the product to my Wacom Intuos 4 Medium Tablet. The only gripe I have with it is that it offers more resistance to the nib of my stylus than I would like, but I was able to get used to it after a few hours. The packaging was professional and the instructions on application and care are very straight forward. I will buy from PhotoDon again. Thanks, Michael! You might want to try 6HS next time. Or, better yet, buy a sample pack of the clear films so that you try before you buy. We include a $5.00 coupon towards the purchase of your screen protector when you buy a sample pack. Perfect custom cut for my new Dell laptop. Customer service was very easy to work with - they walked me through everything that was needed for a great custom cut. Installation was fairly easy. Very happy with the product!! Quick shipping, too!! Purchased 5" x 9" piece of MXO screen protector for fingerprints only, not the one offered by PhotoDon for the Honda Pilot that is matte finish and has anti-glare properties. This is a truly clear protector, no matte finish, and clear is what I wanted. PhotoDon advised me that the MXO might delaminate, but ordering the 5" x 9" size and not applying over the curved edges of the screen will hopefully reduce the possibility of that happening. WORKS GREAT FOR FINGERPRINTS, and from what I can tell, fingerprints on the Pilot screen are, or in my case were, the major issue. The MXO film is great for fingerprint reductions, isn't it? We hope you have complete success over time with the film and that delamination doesn't become an issue for you. This is good to know! Thank you, Allan! It works perfectly as intended! At first, I was worried it was going to be difficult to install, but it was very easy and I have no bubble! Yay! You did it! No bubbles! I buy the MHX for instal on a Yiynova 20U+. I receive mine 1 week after and it's perfect. I make an " Exact " size for the touch zone and i can't regret my purchase. This is great news! We agree: The MXH is a fantastic film! I have quite alot of experience with screen protectors and simply put PHOTODON is the best...PERIOD. I wish I would have used them sooner. I recently purchased this for a newly acquired Wacom drawing tablet. I am thoroughly impressed...especially with the corners and overall cutting. Just WOW. Do they use lasers to cut these corners? :) I got the 1mm/square option and they are literally perfect! ...Machine grade perfect. These people take precision very seriously. They have gained a lifetime customer. Wow! Thanks, Matthew! You made our day! Oversea delivery was surprisingly fast - it took just 3 days! Package was wrapped VERY carefully and my special needs were fulfilled completely. Only problem was that I was told that privacy filter do not degrade the picture except dim. It was not absolutely true, but that's just a feature of any privacy filters. We're happy to hear the the delivery was fast! Thanks for the feedback. Great quality, fast and reasonable international shipping. Cut to perfect size and quality, came with plenty of extra bits. We do our best to provide the best international shipping rates possible. We're always looking for suggestions! Thanks for the review! Nothing to said about this product, is easy to instal and very good quality. the only problem is the price is more expensive than last year we pass at 6.75$ to 10.65$ for 100 pieces. I try to explain my probleme, but he propose another product less good and less expensive. We try to keep our prices competitive. We're glad you had an easy install, and we really appreciate your repeat business. Please contact us for a customer appreciation coupon towards your next purchase. The 6HS works with the XP-Pen 22 tablet, its it able to register all of the pen pressure. The 6HS is also very smooth which is great if your looking to work on your digital tablet with pen because of less wear and tear. Color production and everything else is great for what I am using. This is terrific news! We appreciate your taking the time to let others know about your experience with 6HS and drawing tablets. Pros: Quality, fit, anti-glare Cons: None! I had three custom MXH anti-glare protectors made for the LCDs on a Nikon F5 with the MF-28 back. They fit perfectly! They were shipped in excellent packaging and included terrific instructions. The anti-glare is just enough to improve readability when outdoors in bright sunlight. They also minimize fingerprint smudges! This is terrific news! The MXH is a great film, isn't it? Thanks for taking the time to give us feedback. Pros: excellent as always Cons: MXK works as advertised, but I should have ordered MXO or MXC. This is like the 3rd or 4th screen protector that I purchased from Photodon. Typical superior level of packaging, instructions, and quality of the final production. I ordered MXK; I should have ordered MXO or MXC...I may do this in a few months. We appreciate your loyalty and your feedback, Amory. We always aim for superior service, products and prices. Installed on our 2015 Honda CRV Touring - I measured the exact screen dimensions and received a protector that was a perfect fit top to bottom and easy to apply using the directions. No impact to the touch screen interface at all except now there are no more fingerprints! right and the screen protector did not include that, so I had to cut a small notch section of the bottom right and then it fit perfectly! I could only give 4 stars since I had measured and identified the cut-out for the microphone on the bottom Honda CR-V Touring touch screen with the microphone. We've used PhotoDon's screen protectors in the past on industrial screen and were interested to see how they preform on non-glass touch screens on our new time clocks. We had to get the screens custom cut to our size and that was pretty easy on PhotoDon's website. When the product arrived, packaged very well I must say, we installed it on the first screen and proceeded to test. The MXK film we got had the same feel as the original and it let the touch pass thru to the screen. There was no change in the pressure you need to apply to have the screen react. Light touch or heavy touch, it didn't matter. Same as touching the original. Thumbs up there. The anti-glare didn't make a difference as the screens are indoors and no bright lights are an issue for our location. YMMV. It did help a little on the viewing angle. Narrowed the field of view slightly, enough to keep prying eyes at bay. Would be easier to install if vertical detention 1mm less than I ordered for My RayMarine GS125 MFD. I am using it as a screen protector and will know more about durability with time. Please use decimals rather than fractions or an error may occur.
. We're available for questions at 847-377-1185, Live chat with us or email us.